The two demo scenes produced with the shader. We had to write a RSL (Renderman Shading Language) shader for one of our assignments. The pictures you see are two simple scenes constructed in a RIB file, using the shader on different objects with different parameters, so that all it’s features can be demonstrated. Here is the actual code for the shader. 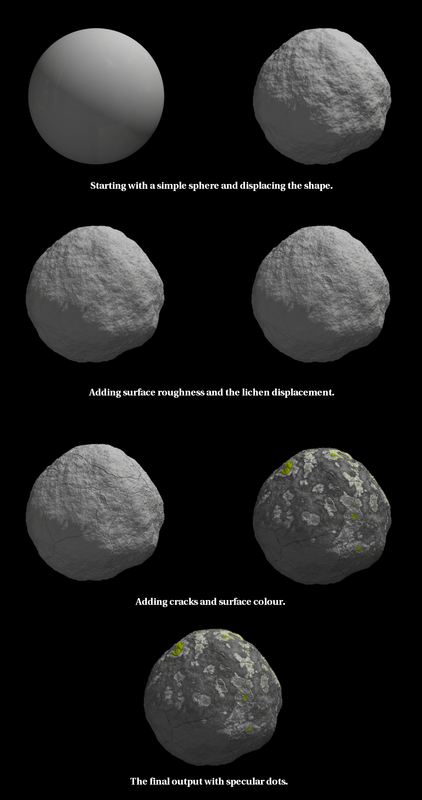 The repo includes Displacement shader, Colour shader, a noise lib file which contains slightly modified algorithms from the originals that were taken from the ‘Advanced Renderman’ book. The repo also includes the two scene files which were used for the images above. (The scene files wont work straight out of the box as I am not including the exr image which was used as a environment map, as well as the background images and a wood shader used in one of the scenes). As I have written in the conclusion of the report, it can easily be modified, further extended or even translated and optimised into another shading language, for real-time rendering. I am using well known techniques and algorithms and nothing too crazy. The main things I am using, as one can probably tell, are: fBm, turbulence, voronoi and cellnoise.